Home Home Prairie Views Pastor’s Corner: O March Madness, how great thou art! The huge matchups, the upsets, the pure insanity of it all. Yes, nothing beats March Madness. I mean, who saw “Blest Be the Ties that Bind” beating “Come Thou Font of Every Blessing” coming? Oh, did you think I was talking about basketball here? I’m sorry. No, I was talking about Hymn Madness. 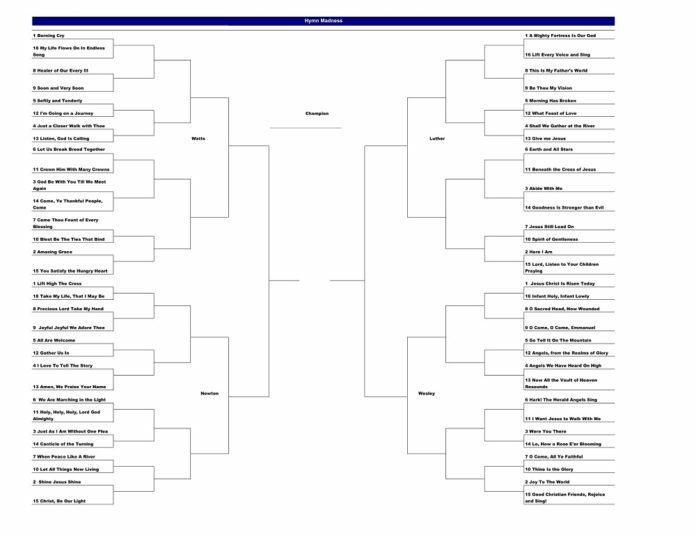 You know, the annual hymn bracket where people vote every week for their favorite hymns until a winner is crowned. Okay, maybe you still have no idea what I am talking about. It is something I started a couple of years back at Mount Olivet, and it has now become a yearly tradition. A really fun one as well. And while it may not be quite as exciting as the madness that comes with basketball, it is still plenty exciting to a church nerd like me. To my surprise, it has been plenty exciting to many of my church members as well, which I was not sure was going to be the case. 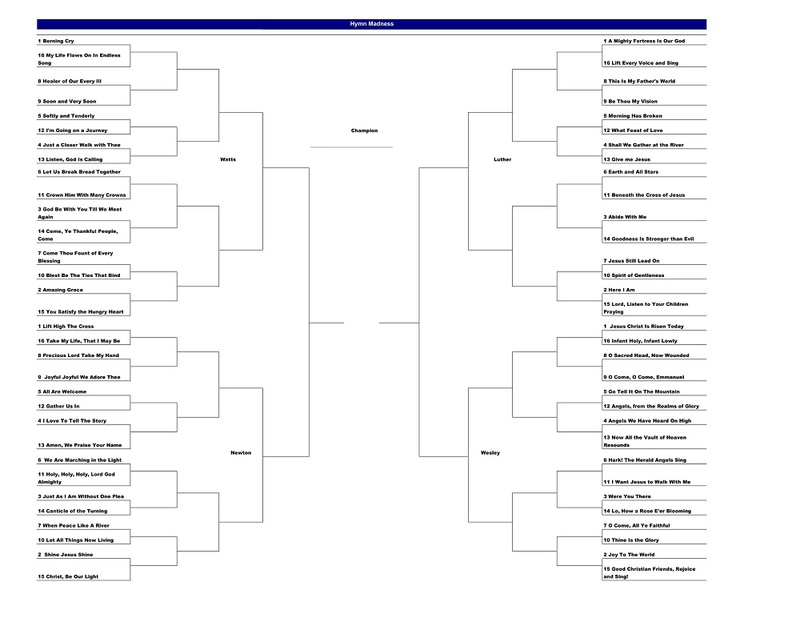 When I first started our Hymn Madness bracket a couple of years ago, I really had no idea how people would respond. Not everyone is as into brackets and hymns as I am. But I have been pleasantly surprised with just how into it so many people are. It has been great seeing all the conversation that has been happening around church as people fill out their brackets — overhearing people trying to convince others to vote for their favorite — watching people checking out the big board and seeing their reactions to some of the winners and losers. People really get into it. I guess people love their hymns. Which really should not have surprised me. I know people love hymns. Anyone who has spent much time in a church has favorite hymns they love to hear and sing, hymns that inspire them, hymns that encourage them, hymns that give them strength through life’s ups and downs, hymns people will carry with them throughout their entire lives. I love worshiping with people in the nursing homes and seeing them light up a little when we start singing one of their favorite hymns. My favorite hymn is “Come Thou Fount of Every Blessing.” It has been more than just a hymn for me. It is something we sang together as a congregation at my wedding. It is also something people will sing at my funeral. Every time I sing it I get a little emotional. Not just because of the history I have with it but because the lyrics perfectly capture my walk as a Christian. When I sing, “bind my wandering heart to thee,” I mean it. Every time I sing it, I mean it. That is why hymns are so important for people. It isn’t because of how catchy they are. Although some are fairly catchy, let’s be honest, there are no hymns topping the charts. No, it is the lyrics that speak to people and make them so meaningful. For in the lyrics of hymns we find words of hope and inspiration. We find good news of God’s forgiveness and love. We find passages of praise and awe to raise up to our amazing God. That is why hymns are so great. For in hymns we find the heart of the gospel. In hymns we find inspiration. In hymns we find God. In hymns we even find — ourselves. So what are your favorite hymns? Why do they mean so much to you? I would love to read your stories in the comments. Whatever they are, I hope you get the chance to sing them often and sing them loud. The Rev. Jeremy Winter is pastor of the Mount Olivet Lutheran Church in Perry.